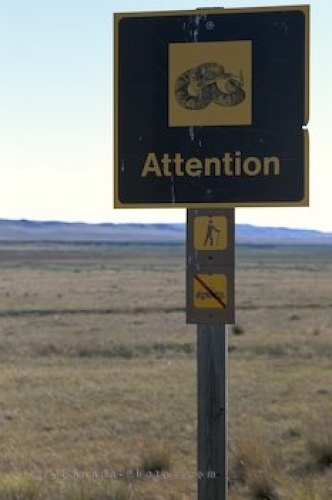 Grassland National Park is the only place in Saskatchewan, Canada where you will see a sign warning of the possibility of a snake in the area. This type of landscape is where rattlesnakes love to be and if hiking through the valley, always keep your eyes open for a snake hiding amongst the grass. Picture of a sign warning of the danger of crossing paths with a snake in Saskatchewan.